The Jeep Wrangler JK is in a class of its own when it comes to customization and aftermarket choices. Owning a Jeep is more than driving a vehicle, it's a lifestyle. 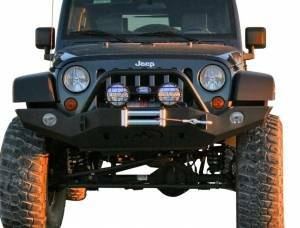 At BumperSuperstore.com we have compiled a collection of aftermarket Jeep Wrangler bumpers from a range of leading manufacturers. Products range from winch bumpers, stubby bumpers, rock crawler style, on-road lifestyle bumpers, tube bumpers and MOD style bumpers (Smittybilt). We carry the best after market Jeep brands including: Warn, Smittybilt, Olympic 4x4, Body Armor, ARB Jeep Bumpers Fab Fours, Pure Jeep, Pavement Ends, Warrior and more. Smittybilt makes the best selling MOD Front Bumper. The MOD Front Bumper is full customizable bumper that starts as a stubby bumper (center section only) and allows you to customize it with various options. We are your Bumper Superstore for anything Jeep you need. If you have questions about and application call us today at 1-720-895-1744. 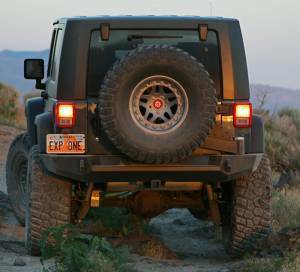 Browse our Jeep Wrangler JK Bumpers below. Jeep JK Bumpers on sale now at BumperSuperstore.com! Order online or call us today at 1-720-895-17442 for more information.